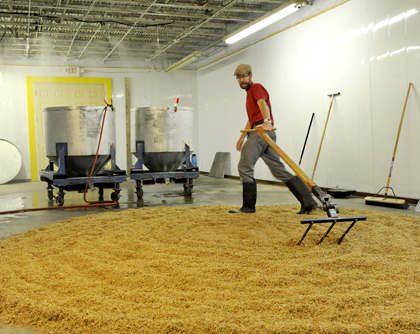 Brian Simpson rakes malt at Riverbend Malt House in Asheville, NC. Spend enough time in a tavern or a taproom and you’ll almost certainly hear it. Hophead: a beer lover with a bad case of the bitters. From extra-pale ales to imperial stouts, nothing makes them happier than a pint exploding with hop flavor and aroma. You know who you are. Plenty of brewers put themselves in the same camp, too, creating beers with names like Palate Wrecker and Hopzilla that clock in at 100 IBUs or more. Of course, as any brewmaster will tell you, those big beers only work by starting off with lots and lots of barley. Barley that needs to be malted first. For the most part, the majority of the malt produced for the beer industry comes from a relatively small number of large businesses—companies like Briess, Cargill and Country Malt in North America, or Bairds, Castle and Weyermann in Europe. In the United States however, recent trends in craft brewing are showing signs of gradually changing the norm. Across the country, breweries have been opening at an astonishing rate. As of March, the Brewers Association, a trade organization that works to protect and promote small and independent brewers, estimated that 409 new brewpubs and microbreweries had opened in 2012, pushing the total number of breweries over 2,400. Many of these newcomers work on a small scale and occasionally face challenges when sourcing the top-quality ingredients they need to make their ales and lagers. A steady supply of malt (or hops for that matter) from a big maltster or grower typically requires a contract, something that can be tough for a new brewery to quickly secure. In other words, it doesn’t take young brewers long to realize that their new vocation is about more than mashing, sparging and boiling—it’s about sourcing, too. Over the last handful of years, the beer community in the United States has been buzzing about the appearance of small hop farms, particularly in the East. Veteran growers and aspiring farmers, encouraged by educational institutions like the University of Vermont, Cornell University and Michigan State University, are already tending to and expanding starter hop yards. They’re counting on a rising demand for this sought-after brewing ingredient to turn their half-acre gardens into viable commercial enterprises. Interest from brewers has been strong, and signs point to continued development in the years ahead. Fueling this trend in part is an increasing appetite from consumers for locally grown products, whether it’s carrots, corn or Cascade hops. On the heels of this news comes the emergence of small-scale, or micro-malting operations. Working with nearby farms that cultivate barley, as well as a portion of wheat and rye, these micro-maltsters are reviving a trade that goes hand in hand with craft brewing. And they’re responding to some of same forces that motivate hop growers—food miles as a meaningful unit of measure and locavores as a desirable demographic to reach. Out of this new class of maltsters, Valley Malt in western Massachusetts has probably received the most attention so far and can already be called a success. But it is far from the only company occupying this niche. FarmHouse Malt quietly opened in Newark Valley, NY, earlier this year, Riverbend Malt has stepped up to the plate in North Carolina, Rebel Malting has built a business in Reno, NV, Pilot Malt House of Grand Rapids, MI, recently began shipping 50-pound sacks of barley to brewers throughout the Midwest, and Colorado Malting in Alamosa continues to grow fast. The question to ask, then, isn’t whether or not micro-malting has caught on. It’s how many more entrepreneurs will take the plunge in the years ahead. Lance Jergensen was one of the first people to venture into micro-malting, building a unit in Reno, NV, in 2004 to process organic grains for his family’s Los Angeles-area beer business, Jergensen Brewing Co. Converting his garage into a malt house and fabricating the systems himself, he kept his overhead low and decided that his Rebel Malting would be more likely to succeed if he concentrated on the local Nevada market. Much of his demand comes from homebrewers, but to date he’s worked with Great Basin Brewing, The Brewer’s Cabinet, Under the Rose Brewing, Stoneyhead Brewing and Silver Peak Brewery, all in Reno. Now that his business has begun to mature, Jergensen is also attracting customers from farther afield, including Cowlitz River Distillery in Washington State. Nonetheless, his business of late has grown a steady 10 to 15 percent annually. Several area two-row barley farms with close to 2,000 acres also make expansion a real possibility for Rebel Malting in the future. For now, though, Jergensen sees alternative grains (primarily rye and corn but also millet and emmer wheat) as a niche that will keep him sufficiently busy. He’s also begun to work on sprouted grains to be milled into flour for baking. Given the limitations of his facility and his focus on local distribution, he views this related activity as another emerging market for his little malt house. Ultimately, Jergensen says, his goal is to become his own “end user” by opening a distillery in the town of Tonopah, NV, about halfway between Reno and Las Vegas. “That way I don’t have to go out and do sales calls,” he explains. When Andrea and Christian Stanley decided to start Valley Malt in 2010 (after considering the idea of a small brewery along the Norwottuck Trail, a bike path linking Amherst and Northampton in Massachusetts), they went to Jergensen for advice. They also found videos on YouTube that explained the process. So they wrote a business plan, applied for a loan and constructed a small system based on information collected from British malting texts and booklets published by the Department of Agriculture. Christian, with a background in mechanical engineering, did the design work. They’ve since upgraded to a much larger system that allows them to produce malt in 4-ton batches, but they began by learning the basics malting 10 pounds at a time. With their newfound understanding, the Stanleys launched Valley Malt in 2010 with the ability to malt 1 ton of barley per batch. Regional craft breweries quickly came calling, from Allagash and Peak Organic in Maine to Throwback in New Hampshire, and Notch, Wormtown, Cambridge Brewing and Ipswich Ales in Massachusetts. With their niche business expanding, Andrea quit her job as a vocational rehab counselor to devote her time to Valley Malt. Christian, meanwhile, continues to work as a mechanical engineer. Today the couple produce pale, pilsner, chocolate, wheat and rye malt for roughly 30 breweries and distilleries, sourcing their grain from about 20 regional farmers. It has since planted over 200 acres of two-row proprietary Dare and Risk barleys along with 35 acres of Dream Rye in the state’s Tygh Valley. In fact, the Rogue Nation Department of Agriculture now includes a 42-acre micro hopyard, an apiary, a 10-acre pumpkin patch, apple, cherry, peach, plum and hazelnut orchards as well as chickens, turkeys and even a couple of potbellied pigs. In 2011, the brewery also announced the completion of its Farmstead Malt House, a facility Rogue Farms uses to micro- and floor-malt the barley used in Good Chit Pilsner, Single Malt Ale, and Oregon Single Malt Whiskey. According to Joyce, a single-malt vodka might also appear in the near future. The diversification of the business didn’t come without its share of setbacks, though: A wave of slugs wiped out the first crop of Dream Rye. And snow and hungry geese have been challenges to the barley crop. Building the malt house took time, too. But according to Joyce, Rogue really likes doing things itself and wasn’t going to be discouraged by slugs, geese or weather. Brian Simpson, a hydrogeologist who ended up in Asheville, NC, after a consulting stint for a biodiesel co-op in Wilmington, agrees with his beer industry colleague. Committed to sustainable practices and inspired by the floor malting techniques that have won awards for Copper Fox Distillery in Sperryville, VA, he and business partner Brent Manning started Riverbend Malt House in 2011. Simpson (and Manning, for that matter) came to his new occupation somewhat unexpectedly, after an eye-opening conversation about the meaning of local food and its relationship to the thriving beer scene in North Carolina’s de facto brewing capital. In many ways, that realization nudged him closer to a new career in malting. Information from the North Carolina Cooperative Extension Service, the U.S. Department of Agriculture and the Carolina Farm Stewardship Association proved to be invaluable to Simpson and Manning’s plan, as did a number of homebrew trials using smoked malt procured from their visit to Copper Fox. Once they learned that the state’s growers planted about 20,000 acres of barley and 700,000 acres of wheat, they decided to take the plunge. Today they sell six-row heritage malt, six-row pale malt, Carolina rye malt, Appalachian white wheat malt and Appalachian red wheat malt, and have worked with Weeping Radish Brewery, Fullsteam Brewery, Top of the Hill Brewery, Pisgah Brewing Co., Wedge Brewing Co., Wicked Weed Brewing and Asheville Brewing Co., among others. Like the Stanleys in Massachusetts, Erik May and his business partner Paul Schelhaas thought about opening a brewery before seeing more opportunity in malting instead. Noticing a conspicuous lack of local malt houses in Michigan, the two weighed their options, assessed their probability of success, and decided to follow their entrepreneurial instincts into a new line of work. May, an Air Force veteran and an active member of the Michigan Air National Guard, takes care of sales and marketing for Pilot Malt House, their ambitious little startup, while Schelhaas, a licensed electrician with experience as a homebrewer, handles malt production and distribution. Both share a passion for craft beer, and neither lets the fact that Michigan has a small number of barley farms get in the way of their aspirations. May and Schelhaas currently work with about half a dozen farmers through the Michigan State University Extension office, but remain confident that they will increase the number of growers along with acreage as Pilot continues to attract more business from area breweries. Due to a shortage of local grain, the pair currently purchase a portion of their supply from North Dakota. Nevertheless, May remains hopeful that they’ll be able to transition to a 100 percent Michigan-grown malt house by the end of the year. He also hopes to be able to eventually offer as many as 14 different malt varieties. Again and again, micro-maltsters return to the notion of beer brewed with a sense of place. They talk about grain as an ingredient with terroir, an idea that is echoed by brewers looking to distinguish themselves in a crowded market. So while the appeal of hop flavor isn’t likely to diminish any time soon, perhaps we’re witnessing the emergence of a second type of beer drinker, the malt maniac. And maybe, like Rogue and a handful of others, brewers will begin to call attention to the provenance of their barley, wheat and rye. From a business perspective, emphasizing terroir also makes sense for small maltsters who can’t match the prices offered by their much-larger competitors. By working with breweries that share an interest in promoting native beers, micro producers like Pilot Malt House and Rebel Malt don’t have to go head to head with big malt companies that have an advantage in terms of price per pound. Others think the argument that micro-malted grains are too expensive is just an excuse. They contend that the grain bill makes up a very small part of the overall cost of a beer and stand behind the quality of their local products. In 2008, after growing two-row barley on contract with Coors for 48 years, Cody and his family were looking for a way to add value to their farm. Knowing that white spring wheat, red winter wheat and rye all also grew well in the high-altitude San Luis Valley and figuring they could start by selling malt to homebrewers, they converted an old 540-gallon milk tank into a unimalt system and set to work making base malt. They also decided to move away from exclusively growing Coors barley varieties, got help from a few of the macro brewer’s former malting advisers and benefited from something else many new businesses hope for but can’t always count on: good timing. San Luis Valley Brewing Co. in downtown Alamosa came calling soon thereafter, and before long the Codys were moving all the malt they could produce. Converting a barn into a dedicated malt house and adding another tank to their operation enabled them to meet demand for a while, but this proved to be a temporary fix when breweries like New Belgium, Dogfish Head and Oskar Blues began placing orders. In its first year, Colorado Malting produced an average of 2,000 pounds of malt per month. Now it’s up to 40,000 pounds every 30 days, and Cody has plans to add two more malt vessels before the year is done. He also estimates that his company will bring in $1 million in revenue in 2014. Ben Keene writes about beer and travel for a variety of publications. The author of two guidebooks on hiking and camping in New York, he is also the social media manager for the North American Guild of Beer Writers. Owens & Sons Malt Co.
Any breweries malting their own?